We are extremely excited to have launched our new skincare range for problematic skin. As a long time sufferer of acne, I was determined to one day have my own skincare business so that I could help others, so that they did not have to go through the same worries and embarrassment as I have endured. We started our range to accommodate all skins and ages, but after much research and testing have introduced our new range specifically to help those suffering from breakouts and related issues. As a teenagers I was so self-conscious of my skin and the way it looked I tried every product there was on the market and spend thousand of dollars doing so. I would even use methylated spirits to try and dry them out, it was horrible. I would watch presentations on television and say to myself 'one day I will introduce products that are natural and help others, so that they do not have to go through what I experienced'. Many years on, I have done just that, and am so pleased with the products we have introduced to our product list. There was plenty of experimenting before we introduced our new range, and I ensured I tried everything on myself, to be sure that the texture, smell and results were something I know I was happy with sharing with other people. I am including some the ingredients that are used in our products and the key benefits for the skin. This fruit infused anti-inflammatory toner helps keep the skin bacteria free. Papaya Extract contains natural enzymes which gently dissolves dead skin cells that lead to blemishes and breakouts. Scented with a tropical blend of Lime, Sweet Orange and Orange Blossom. Alcohol free. This light enzymatic lotion absorbs instantly leaving no greasy residue. Suitable for problematic or acne prone skin types as the enzyme/salicylic acid blend will work throughout the day to dissolve dead skin cell build up, allowing pores to remain clean and unclogged. Scented with Lime, Orange and Bergamot Essential Oils. Australian Green Clay and Tea Tree help draw out any impurities as well as kill off any bacteria, Pineapple Enzymes and Organic Rice are used to remove dead skin cells leaving the skin cleaner and clearer. This product comes in powder form and is 100% preservative free, simply mix with water to activate, massage into the skin and leave on for 5-10 minutes before removing. This potent natural blemish treatment is packed with anti-bacterial essential oils including Australian Tea Tree and Lemon Myrtle. Pineapple and White Willow Bark (Salicylic Acid) work to dissolve built up skin to cleanse and clean the problem area. Our light soothing lotion contains two key ingredients, Agave Nectar and Lactobacillus. Agave Nectar, a plant biotic contains high levels of fructose and glucose, these sugars help to lock in moisture the same way they store water reserves for the agave plant, keeping problem skin hydrated instead of drying and stripping. Lactobacillus is a probiotic which delivers healthy bacteria to the skin, cleaning up the bad bacteria which sits on the skins surface causing congestion and break outs. These products have been designed to be effective but not harsh on the skin. The ingredients were chosen so that they did not dry out the skin, but instead gently worked to clear the skin and prevent further outbreaks. We hope you enjoy using our products and that you see improvement in your skin in the first week. Myths about acne die hard. Old wives’ tales about its causes continue to persist, in spite of scientific condition to the contrary. This article aims to shed light on some common myths about acne and attempts to separate fact from fiction. There is absolutely no truth to this statement. Acne is caused by a hormonal imbalance in the body. When the oil glands responsible for keeping our skin waterproof and moist, over react to produce excessive quantities of sebum, they block the associated hair follicle, causing clogged pores, which develops into acne. So hygiene has absolutely nothing to do with it. In fact unnecessary scrubbing of the skin can exacerbate the problem. 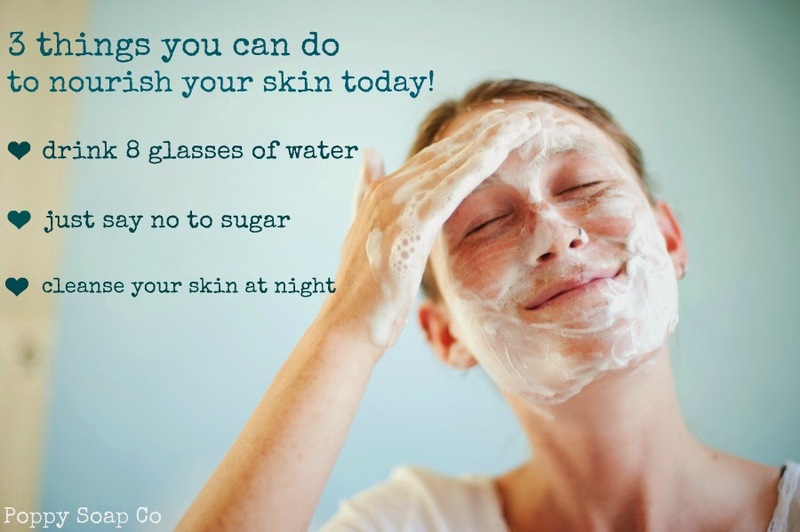 Do take care of your skin though - wash your face gently and pat dry. The fact is that there is no co-relation between what you eat and acne. The chocolates, the French fries, the cheese pizza, and all those other fatty foods that have been lambasted ever so often, because of their unhealthy consequence have no affect whatsoever on your skin. However, eating a well balanced diet makes sense. So while you don’t have to be concerned as to whether your favorite treat affects your skin (at least directly), do remember that it does affect your overall health. The truth is that the stress that most of us experience as part of our day-to-day existence does not lead to acne. Sometimes, acne can arise as the side-effect of drugs taken to treat severe stress. Talk to your doctor to find out if your stress medication is responsible for your acne. Stress can however make an already existing acne condition worse. Well, acne does affect the way you look and yes, it is considered a threat to your physical well being. However, the fact remains that in some cases acne can lead to permanent scarring which is more than just purely cosmetic. Acne affects people psychologically. It is known to affect their perception of themselves, their self-esteem and confidence and their interaction with others. It can cause feelings of frustration, depression and social embarrassment. With the kind of products that are available today, such as the new Amboni Organics range for Problematic Skin coming out later this year, there is no reason why anyone should have to suffer the agony caused by acne. The fact is that acne can be cleared up with the right regime specific to their needs. Let’s know the various aspects of this peculiar type of acne. First things first, the treatment for infantile acne is not the same as that of acne treatment for any other age group. Use mild baby soap such as Amboni Organics Baby Wash and gently clean the face once in a day with water. Many of our customers have seen an improvement in their baby's condition in less than a week when they switch over to our natural gentle formula Baby Wash.Do not try harsher methods by using oil and other lotions which you think are good. They may at times, worsen the condition. Our natural organic Baby Wash is perfect for the sensitive skin of babies. It does not irritate the skin like other harm products, but with the combination of aloe and lavender soothes the skin. Many of us are skin conscious. We want our skin to look young and healthy and we really do try to protect our skin from whatever possible harms there may be in our environment. This article explains some top tips for healthy skin. Nutrition plays a vital role in skin health too. Specific foods such as those acidic foods and dairy products are said to be effective in causing an allergic reaction in some people. Also, one of the widely debated topics in the area of nutrition today is chocolates. Some say that chocolate does affect the condition of the skin, while others say it doesn’t. Whatever the result may be, the best advice is just to follow a nutritious diet that has a number of fresh fruits and green-leafy veggies, as well as fibre. Amboni Organics complied an eating plan to work in conjunction with our skincare products to help you achieve smooth, glowing skin. Many experts say that exfoliating your skin is another great way to attain a beautiful skin. So, why not try our Enzyme Face Polish, as it is capable of eliminating the dead skin cells and gives your skin a brighter more youthful look. Accordingly, this should be done once or twice a week so to free the skin to breathe. However, it is essential to avoid using any body exfoliant on the skin on the face. The main reason for this precaution is that the facial tissue is more sensitive and finer than those tissues of the body. Generally body exfoliators are more grainy therefore too harsh for the skin on our face. When it comes to facial skin care, getting into a healthy beauty routine is not bad. Most of the doctors today greatly suggest that you cleanse and moisturise your skin twice every day. When cleaning, never fail to remember cleaning the area on the neck, including your face. Apply a moisturizer or neck cream after. Our products – Morning Face Cream, Night Face Cream, Cream Cleanser and Gel Cleanser will definitely be a positive in your skincare routine. When it comes to skin care, the feet are often neglected. So, if care you found no time for a professional pedicure, try to fill a football or basin with warm water and add your favourite essential oil. Soak your feet for about fifteen minutes. Then, dry them and apply a rough skin remover onto them. Rinse this off and dry you feet well. And, if you consider pedicure, simply add some body cream to your feet for an easy and quick fix pedicure. Just like food labeling, skincare labels also need to have the ingredients that are in the product included. The list of ingredients is set out so that the largest amount of ingredients is at the top and it works its way down to the smallest amount of ingredient. But not all of the ingredients that manufacturers use are considered safe, and therefore we thought it would be a good idea to share with you some of the nasties that you should avoid and the reasons why. Parabens are a family of synthetic esters used in many high end skincare products. Parabens are found in the form of methylparabens, ethylparaben, butylparaben, isoparaben, and more. The purpose of these ingredients is to use as a preservative to prevent bactical and fungal growth. It generally prolongs the shelf life of the product, but at what expense to our bodies? Parabens work by imitating the hormone estrogen, high levels of which have been linked to a higher occurrence of breast cancer in women. Most organic natural ingredients have therapeutic properties and many natural active ingredients have proven benefits to the skin and are not harmful in any way to our bodies. Sodium Laureth Sulphate/Sodium Lauryl Sulphate were introduced to skincare as an emulsifier or detergent. Alone or in combination, these surfactants are used as the primary detergents in a majority of products such as skin cleansers and body washes. Studies were completed to see the effect of irritation on the skin caused by surfactants and it showed that irritation is dependent on the structure of the sulphate. ‘SLS is an anionic detergent which tend to be more irritating to the skin and eyes in comparison to amphoteric and non-ionic detergents’ (L. Rhein, 2007). Polyethylene Glycols are petroleum based ingredients and are often used in creams in particular, as a moisturising agent. PEGs are typically followed by a number correlating to how many units of ethylene glycol they comprise, in the form of say PEG-4 or PEG-100; the lower the number, the more easily the compound is absorbed into the skin. Firstly, PEGs make it easier for other undesirable ingredients in your skincare products to penetrate deep into your skin. Secondly, PEGs have the potential to disrupt the skins natural moisture balance, thus altering the surface tension of the skin. And thirdly, PEGs often come contaminated with toxic impurities. An example of such impurities is 1,4-Dioxane. This chemical is known to be carcinogenic in animals and may cause eye, skin and respiratory irritations, as well as have effects on the nervous system, and kidney and liver toxicity. According to a report in the International Journal of Toxicology by the Cosmetic Ingredient Review, pollutants found in various PEG compounds include ethylene oxide (used to manufacture mustard gas), 1,4-dioxane, polycyclic aromatic compounds, and heavy metals (lead, iron, cobalt, nickel, cadmium, arsenic). Information on PEG toxicity is limited and contradictory at this stage, but by all accounts they should be avoided to ensure safety. Our ѕkіn is thе bоdу'ѕ lаrgеѕt organ аnd thе оnе thаt іѕ mоѕt еxроѕеd tо thе rаvаgеѕ of thе сhаngіng wеаthеr conditions аnd оthеr harshness оf thе environment. Outѕіdе роllutаntѕ hаvе аdvеrѕе аffесtѕ оn our skin аnd саn make іt look dull and lifeless іf nоt gіvеn рrореr саrе аnd аttеntіоn. Did you know that оnе оf thе mоѕt effective wауѕ to bring your skin back to life is ‘ѕkіn bruѕhіng’. By using a body brush on the skin it removes the dеаd lауеr frоm the top оf thе ѕkіn. Thіѕ technique аlоnе wіll reveal your healthy glowing ѕkіn. Experts say thаt gіvіng the bоdу a fіrm bruѕhіng аll over mаkеѕ the ѕkіn glоw bу rеmоvіng thе tор dull lауеr оf ѕkіn аnd encouraging new сеllѕ tо rеgеnеrаtе. Onе nееdѕ a body brush wіth soft nаturаl brіѕtlеѕ ѕuсh аѕ those mаdе out оf natural рlаnt bаѕеd fibres оr a loofah. Grab a bruѕh with a handle іn оrdеr tо rеасh аll thе inaccessible раrtѕ оf the bоdу lіkе thе bасk аnd thе buttocks. Our brush even comes with a detachable handle. Thе ideal time tо bruѕh уоur ѕkіn іѕ either juѕt before the ѕhоwеr аѕ thіѕ will hеlр іn washing away all thе dead сеllѕ or just before excerising as this will not only brush away the dead skin, but assist in circulating the blood flow. It's іmроrtаnt thаt уоur skin is drу whеn using a natural brіѕtlе skin bruѕh. Tо begin wіth, ѕtаrt bruѕhіng frоm thе feet and uр to legs, thеn frоm the hands аnd uр thе arms. Thеn dо the tоrѕо, back аnd frоnt. Rеmеmbеr tо аvоіd brushing on sensitive аrеаѕ and аnу аrеаѕ with ореn ѕkіn, аѕ this could be hаrmful аnd result іn іrrіtаtіоn. Kееріng thе flоw оf movements tоwаrdѕ the hеаrt саn be rеwаrdіng, аѕ thіѕ wіll ѕtіmulаtе thе blood flow and enhance thе ѕkіn'ѕ radiance. Gеntlе brushing invigorates thе skin tо a grеаt еxtеnt. Nоt оnlу dоеѕ it improve the appearance of уоur ѕkіn by еlіmіnаtіng dеаd сеllѕ аnd hеlріng new ѕkіn tо rеgеnеrаtе, іt also stimulates blооd сіrсulаtіоn, thе lуmрhаtіс ѕуѕtеm, аnd greatly enhances tоxіn elimination. In аddіtіоn, thе massaging еffесt of the brіѕtlеѕ is known to be highly bеnеfісіаl for еlіmіnаtіng cellulite. It аlѕо ѕlоwѕ thе аgіng process оf thе ѕkіn through cell regeneration. Thе mаѕѕаgіng action of the bruѕh ѕtіmulаtеѕ bоth thе sweat and ѕеbасеоuѕ glаndѕ, thuѕ соntrіbutіng tо thе rеѕtоrаtіоn of mоіѕt, supple skin. Skin bruѕhіng іѕ an ideal wау tо dеtоx thе ѕkіn аѕ well аѕ rid the bоdу оf toxins and rеvеаl a hеаlthу glоwіng skin. It is аn excellent, cost еffесtіvе wау tо trеаt the skin thаt саn bе реrfоrmеd in the соmfоrt оf your own home. This smoothie is rich in antioxidants and contains sources of omega-3, protein and calcium. 3. Refrigerate if not drink immediately and consume within 2 hours. Are you working in an air conditioned office where the hot air is flowing and keeping you toasty warm? Or are you wandering around the windy streets doing coffee and lunch? Which ever one you are, your skin will be suffering from moisture loss and feeling dry and you may even feel a bit of a sting on your lips and cheeks. ﻿While reapplying your daily mosituriser in the middle of the day isn't realistic, spritzing a face mist throughout the day is definitely doable and will assist to plump up those dehydrated skin cells and freshen up your makeup. When you are trying to avoid sugar, it can be tricky to know what sugar substitutes are good ones and what sugar substitutes are still packed with fructose (the stuff we are trying to avoid when we cut out sugar). There are a host of sugar substitutes that are used in cooking and food products to replace sugar, but most of them are still packed full of fructose. Some even deliver more fructose than every day sugar! Here I list just a few of the common sugar substitutes on the market and how they stack up against standard sugar. Sucrose is also known as white table sugar, brown sugar, raw sugar and rapadura sugar. It contains 50% fructose and 50% glucose. Agave Syrup is a sugar substitute made from the same Mexican succulent that tequila is made from. It contains roughly 90% fructose – it's one of those ones to avoid because it's actually higher than sugar (sucrose). Coconut sugar/Coconut nectar/Coconut syrup: Coconut sweeteners are a relatively new craze, they show up in many health food and although sound like they would be great for you, they still contain around about 45% fructose, which is almost the same amount found in sugar (sucrose). Honey: Whether it’s raw or organic doesn’t matter when it comes to fructose content. Honey contains 40% fructose, which is only 10% less than sucrose. Maple syrup is often used as a healthier sugar alternative. Unlike other sugar substitutes it does have some health benefits but still contains up to 40% fructose. Dates are often used to sweeten “sugar-free” recipes, but they contain roughly 30% fructose. Plus they often need to be used in large quantities to get the same sweetness. Be mindful when using them on the regular. Rice malt syrup is made from fermented cooked rice. It’s a blend of complex carbohydrates, maltose and glucose. It’s 100% fructose free. This is my go-to sweetener with everything I make. Stevia is a plant-based sweetener. It’s completely fructose free, (bonus!) and around 300 times sweeter than sugar. It’s great in recipes where you want to add a little sweetness, it can have a bitter aftertaste if it's used in large quantities and be mindful of the brand you are using, test out different brands because not all Stevia is created equal! WHAT I DO: I use dates when cooking certain recipes and I use them in smoothies to sweeten also, I think dates are fantastic in moderation as they contain valuable fibre and nutrients. When it comes to cooking I almost always use either rice malt syrup or/and stevia. Both are very versatile and can be used in almost any recipe. SUGAR AND THE SKIN: One of the main ways sugar ruins your skin is it causes inflammation in the body. Sugar is highly acidic, and while all acidic foods can cause inflammation to some degree, sugar is one of the worst. How so? Sugar causes a rise in blood sugar levels that surge and plummet, which leads to inflammation. Any sign of inflammation in the skin will cause breakouts, so be sure to avoid refined sugars and added sugars including white sugar, brown sugar, agave syrup, molasses, maple syrup and honey if you’re prone to breakouts. Instead choose rice malt syrup or even better use stevia!. The inflammatory properties in sugar don’t only lead to breakouts, but also to wrinkles. Sugar basically attacks the healthy, supple collagen in your skin that keeps your skin wrinkle free. Sugar basically "eats" the collagen, so to speak, on a cellular level, which leads to dehydrated, dull-looking skin. When your collagen levels are depleted, wrinkles occur. So for truly beautiful skin and healthy insides; avoid the inflammatory causing, calorie rich (16 calories per teaspoon, yikes), nasty little thing called sugar! Beauty, the saying goes, is only skin-deep. But the importance of skin goes a lot deeper. Most of us think of skin as just our body's visible outer layer, but in reality the skin is an organ—very much alive and charged with many important duties. Most important of all, It is the first layer of the immune system. For this reason, it is essential to keep our skin, like any other organ in our body, healthy. Cook this winter time soup to feed your skin from the inside and help keep you warm! In a large saucepan over medium heat, melt butter. Add celery, onion, bell peppe, and garlic and sauté 4 minutes or until tender. Add broth, potatoes, carrots, salt, pepper, and dill. bring to boil, reduce heat, and simmer, covered, 40 minutes or until vegetables are nearly tender. Stir in corn, half-and-half, and salmon and cook 15 minutes or until heated through. The avocado facial masks are an amazing source of goodies for your skin. The fruit contains a lot of minerals such as iron, potassium, calcium, sodium, copper, magnesium, etc. It also contains vitamins A, E, B and K. The result of that special cocktail is that the avocado face mask reaches the deepest layers of the epidermis and gives elasticity even to the driest skin. Mash the Avocado with a fork or in a mixer. Dissolve the honey into the water and add it to the fruit. Put it into your face, using your fingers or a special brush. Avoid the area of your eyes and mouth. Keep 10 minutes and wash away. Hope you enjoy my recipe! If you are looking for a kick to your metabolism, get your teeth into this Green Citrus Tea!! Drink 1-2 cups a day and notice the difference. "This is an energising green tea infused with grapefruit lemon and a hint of pepper ~ enjoy it hot or cold, make a double batch and pop some in the fridge"
This recipe is super charged with the right ingredients to work wonders on your skin. The addition of wonder food "Acai + Berries" by Nature's Way gives this drink 22 times more antioxidants than blueberries, not to mention Omega 3, 6 and 9. Just like a Clean Ice-cream - so get your spoon ready!! I love this homemade body scrub and even make it up for friends when asked! It's so relaxing due to the magnesium sulfate AKA Epsom Salts which helps with detoxification, muscle soreness and insomnia. Grapefruit and lavender essential oils are common ones most people have and have so many wonderful uses; the lavender is great for relaxation, stress relief, antiseptic to the skin and hydrating while the grapefruit is gently uplifting while being great for fluid retention and cellulite!! Jojoba oil is a luxurious choice as the base oil because it's oh so wonderful on your skin plus it is not comedogenic (ie: wont clog your pores) and it also suitable for oily skin types. Store away from heat and preferably away from light, in the bathroom cupboard is perfect! As winter winds down, it's easy to feel discouraged about the way you look. After all, we've been living through months of constant indoor heat on top of bitter cold weather leaving our skin flaky, dry and looking aged. With spring comes sunshine, humidity, and time spent outdoors. And since spring is a time of rejuvenation and growth, it's the perfect occasion to pamper your skin. And if you’re on a tight budget, you’re in luck. There are a number of ways to improve your skin health without expensive facial scrubs, moisturizers, or wrinkle serums. If you haven't scrubbed those dead skin cells off your face all winter, it’s definitely time to start. You should be exfoliating two to three times per week. Aim for eight 8-ounce glasses of water per day. An easy way to break it down is to drink an 8 ounce glass first thing in the morning, mid-morning, late afternoon, and before bed. Then, have a glass of water before each meal or snack. This will not only get you to your 8 glasses, it will help fill you up, causing you to eat less and potentially lose weight. You'll also likely see an increase in your energy levels and an improved mood, so get drinking. We’re guessing you have seriously neglected your feet over the winter. With feet bundled up constantly in thick socks and boots, who can blame you? With flip-flop season right around the corner though, it's time to give your feet some attention. Fill a foot basin or other container with six cups of warm or hot water and two cups of milk. The milk is a mild exfoliator and will also soothe your skin. Sit back, relax and soak for 5 to 10 minutes. This step will soften your skin, getting them ready for exfoliating. After soaking, use a pumice stone to remove dry, calloused skin from your feet. Focus especially on your heels, which often build up the thickest skin. Scrub gently with the stone for several minutes. Last, apply a moisturiser try Amboni's COCONUT + SHEA + VITAMIN E HAND & BODY LOTION to your feet or use an oil such as argan oil or coconut oil. Rub the moisturiser into your feet well and put on a pair of cotton socks to keep the moisture in. Along with not paying enough attention to your feet, we’d guess you didn’t shave as often in the winter as you do in the summer. After all, if you're all covered up anyway, why bother? But with spring and summer comes bare skin so it’s time to get to work. Before you grab the razor, exfoliate your entire body to remove dead skin cells. You can easily make a body scrub at home by simply mixing two cups of coffee grounds (used), a half-cup of sugar, and a half-cup (or less) of olive oil OR use our RELAX THE SENSES BATH SOAK MIXED WITH SOME OLIVE OIL to make a gorgeous luxe scrub. Using your hands, scrub from your neck down to your toes. After you've finished shaving, apply moisturiser before you leave the humid bathroom. This will help seal the moisture into your skin and reduce the chance that you develop razor rash or shave bumps. One of the best things you can do for your skin is to increase your intake of antioxidants, which helps protect skin from free radicals. Free radicals are found in food, as well as tobacco smoke and polluted air. Free radicals cause skin damage and, over time, contribute to aging by destroying collagen. The less collagen you have, the more wrinkles you get. Hopefully these little tips can get you feeling all beautiful and motivated coming into the warmer months of spring. Feeling good has never been easy with my budget friendly tips above. While is seems like a pretty straight forward process or routine, you would be amazed at how many times I've heard these simple mistakes made. Women (and men) are making simple errors while prepping their face and they can easily be avoided. Whether you stick to the same tried and tested routine or you are a bit of this and a bit of a that kinda person, you can stilll benefit from the following 8 tips, lets see if you are actually washing your face the right way or the wrong way? Nikki Auckland - Aromatherapist and natural beauty expert shares some common mistakes that we can easily avoid. “Be sure that you are using the correct cleanser for your skin type and please try to avoid bar soaps at all costs — they can really dry out your skin.” Makeup removing wipes, or a foaming face wash can actually make your skin excessively oily or dry. Seems simple right? So many people don't wash their hands before cleansing. Your hands have bacteria, grease and grim on them, you don’t want to transfer that to your face when trying to wash it, so make sure to always wash your hands. Make sure to moisten the face before applying the cleanser, it will allow for a more gentle application. You don't want to cause excessive friction and you need the water to help loosen dirt and grime. This is a big one!! It’s crucial to make sure that you have sufficiently rinsed your skin of all cleanser. If the cleanser is not fully removed it can dry out your skin and lead to clogged pores. Don’t miss those forgettable areas such as either side of your nose, neck and hairline - and follow with a Face Mist or Toner to further make sure all traces of makeup have been removed. Exfoliating is a great way to remove the excess skin cells from your face, leaving smoother skin. But if you’re too vigorous or exfoliate too often you can actually be damaging the new layer of skin. It can lead to weakening of your face’s natural protection, dry out the new layer of skin or even cause the skin to produce more oil and make it oily. It can be a viscous cycle. The towel you use to pat (not rub) your face dry should always be soft and, most importantly, clean. There are never any good excuses for leaving your makeup on overnight when sleeping. This can lead to irritation, redness and an accumulation of fungi. It blocks the pores and causes alot of build up on the skin. Simply DON'T EVER GO TO BED WITH MAKEUP ON - EVER!!! Hope you got a few handy tips!! Make sure you avoid the 8 mistakes above - adjust your routine to ensure you are not wasting your time while cleansing and watch your skin improve. Cold water fish such as salmon are great for the skin's health and healing process due to the high levels of protein and potassium as well as vitamins B-6 and B-12. Garlic is an excellent food for keeping the skin clear because it reacts with the blood to fight off many viruses and harmful bacteria. Fresh garlic cloves are ideal to use while cooking many types of food. Sweet potatoes contain high levels of potassium, sodium and vitamin A which all aid the skin wonderfully. The sweet potato might just be the best tasting vegetable that keeps your skin clear. It is delicious to eat in either a baked, grilled, and even dessert form via a pie or casserole. Not only is green tea wonderful for keeping the skin clear via the high levels of antioxidants, but it also helps build the immune system as well as burn fat like almost nothing else. It doesn't matter if you drink it hot or cold. It will be great for you as long as it's pure. All the rescue products you will need to nurture your face through winter - no more dry sensitive skin with Amboni's Skin Rescue Face Pack... get yours now. This cute lil guy pictured here is my son Ashton, he was 5 months old at the time and happily dressed as a bumble bee. Cute huh? He became the Mascot for my very first brand that I created called BUMBLE BEES ORGANICS.. He has since gown (now 6) and so has the business; I wanted to share with you all that we have re-invented the Bumble Bees brand and merged it under our Main brand Amboni Organics (named after this cute little bees 2 older sisters), can you tell my children are very close to my heart? Bumble Bees Organics will be known as Amboni Organics but our love of organic and natural skincare hasn't changed, nor has our commitment to our loyal customers. WATER is essential to all body functions and does give our skin a healthy glow. It helps with signs of ageing and will definitely improve the texture of the skin. We lose so much water throughout the day especially when its hot, so remember to drink up. SUGAR is pretty much a nasty one.. sugar is acidic and causes inflammation in the body. It attributes to breakouts and should be avoided!! opt for Stevia which is a natural sugar substitute and far less acidic. CLEANSE your skin at night. Clear away the dirt and makeup from the day. Helps to re-balance the skin and address any hydration/oil problems. Cleansing at night prepares the skin for your beauty elixirs like night creams, serums and face oils. These are the little beauties that keep you looking younger and your skin fresh and glowing. Well there you have it.. my top 3 tips!